For this afternoon only, the artists will be displaying additional works which relate to their art within this month-long featured exhibit. All works will be available for purchase. Refreshments will be provided, and this event is free and open to the public. When the tradition of quilt making intersects with the contemporary world of art making anything can happen. 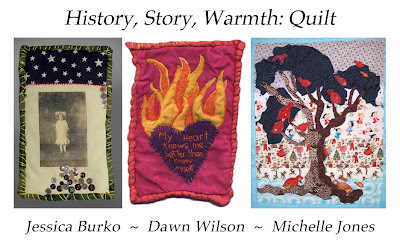 History, Story, Warmth: Quilt presents the work of three New England artists, Jessica Burko, Michelle Jones, and Dawn Wilson. Each of these artists embraces the historical traditions of quilt making and infuses it with their own brand of whimsy and invention. Using text, vintage photographs, variations in scale, and detailed pictorial stitching, these works challenge conventional notions of what it means to be a quilt. That's awesome they are displaying your work for a month. I wish you all the best of luck! Wonderful pieces. I am really sorry that I won't be able to come tomorrow- I've already got something going on :-( Good Luck!